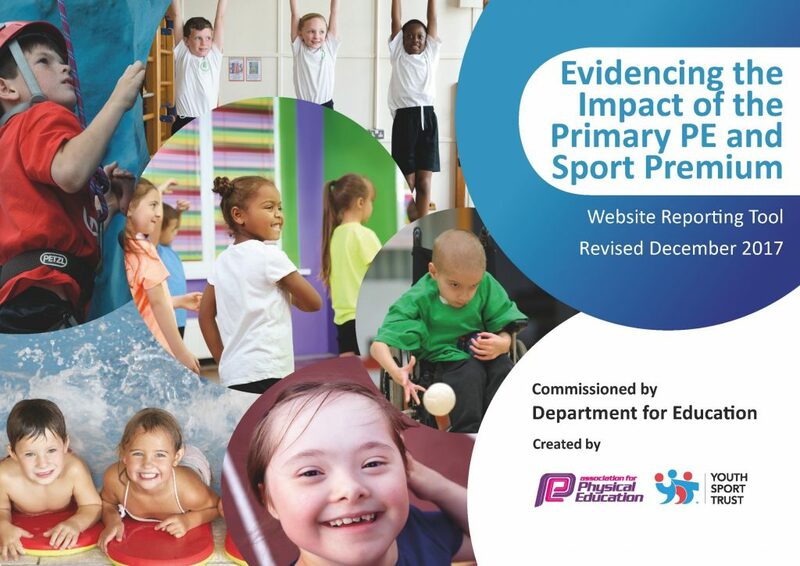 Under the Ofsted Schools Inspection Framework, inspectors will assess how effectively leaders use the Primary PE and Sport Premium and measure its impact on outcomes for pupils, and how effectively governors hold them to account for this. Schools are required to publish details of how they spend this funding as well as on the impact it has on pupils’ PE and sport participation and attainment. We recommend regularly updating the table and publishing it on your website as evidence of your ongoing review into how you are using the money to secure maximum, sustainable impact. Increase participation in an afterschool club to 53% of KS2. Increase participation of girls in an afterschool club to 52% in KS2. Wider range of sporting activities offered to pupils. Increase in participation of sporting festivals. Provision of 30 minute activity for all pupils a day. Confidence and skill level of staff to deliver PE lessons. *Schools may wish to provide this information in April, just before the publication deadline. Increased activity in KS2 at lunch times with engagement in sport. KS1 participate in Wake and Shake 2 mornings a week. Participation in SEN table Cricket and Cricket. Increase activity for less able pupils in KS1. Provision of 2 sports coaches, twice a week, to provide a range of different sporting activities for pupils to participate in. To attend a change 4 life course with PP pupils who do not take part in regular exercise. Increase participation in sport of SEN children. £550 Increase in participation of pupils in sporting activity at lunch time. Pupils able to create their own active activity during other lunch times with sporting equipment made available at other lunch times. Pupils start the day engaged and ready to learn. Increased activity rates on those days. PP increased confidence in taking part in sporting activity. Increasing self-esteem and organisation skills from participating pupils. Providing sporting club to KS1 pupils. Provides increased activity to identified pupils. LA pupils given more opportunity to develop strength, agility and co-ordination. Daily morning activity to be available to KS2 as well as KS1. Increase the number of days wake and shake takes place in KS1. Sustainability of lunch time club. Space and adult support need further investment. Look to building a track to follow. To show that MSM can achieve sporting success. To have fitted football goal posts, basketball posts and netball posts. To have line marking put on to the MUGA. To achieve qualification to a level 3 competition. Fox class invited to participate in a Cricket All Stars session with a professional coach. £600 Improved PE lessons with less time to set up lessons. Increase in activity levels at break times and lunch times. Qualified for a Level 3 gymnastics festival. Increase in pupils belief that they can be successful in sport. Participation in the All Stars Program has led to an increased awareness in sporting clubs outside of school. 12 weeks of provision from a professional cricket coach. Pupils to have engaged with a number of different sports within a competitive environment. How to make the field an attractive space for increased activity. Look at bringing in a Sports coach to work with the whole of KS1. Look for further activities that our SEN pupils can participate in. To become an established annual event. KS1 pupils to have better acquisition of the fundamentals of sport. Increase in knowledge and skills of staff to deliver gymnastic lessons. Increase knowledge of swimming coaching. To attend course on the Fundamentals. Support in planning and delivery of gymnastic lessons across 5 -6 weeks. £1315 Sports TA attended ‘How to coach the Fundamentals’ course. Improvement in planning to include better teaching of the Fundamentals. Improvement in provision across the whole school. Increased confidence in teaching of gymnastics. Increase in attainment in gymnastics. Increase knowledge of swimming to ensure a higher standard of swimming teaching. To provide in house training to all KS1 staff on the Fundamentals. To make available to more staff. To run a swimming club to enable higher achievement in the swimming festival. · Increase the range of activities offered in curriculum time to get more pupils involved. · To widen the range of pupils who take part in additional PE and Sport opportunities. · To ensure girls recognize that they can participate in all sports by offering girls only clubs. To provide a member staff to run an after school sports club. Create a link with Marlborough Golf Club to offer Golf on the curriculum and after school. Work alongside Marlborough Rugby club to upskill staff and to offer rugby on the curriculum and as an after school club. To run a girls’ football club. To run a gymnastics club for KS2 and KS1. Run a cricket club for KS2. To introduce volley ball in to the curriculum. £250 Participation in at least one afterschool club currently stands at 53% of KS2. 41% of PP have taken part in at least one afterschool club. 20 pupils took part in an after school club 7 of whom have not taken part in another after school club. 4 classes have been introduced to golf for the first time. Building relationships between golf club members working with the children will give children the opportunity to continue the sport in the future. 2 members of staff have been involved to increase their knowledge of the sport. Girl’s football club had 16 girls participate. Increase in participation of girls in after school clubs. It is currently 52%. Pupils to have had experience of volleyball. The school will have the ability to run golf lessons within the curriculum and as an after school club without the experts coming in. 2 trained teachers to pass on their knowledge of golf so that further lessons can be run. Look to take part in a golf school festival. Look to run a volley ball after school club. Engage more girls in competitive sports. To take part in a wider range of sporting competitions and festivals. To engage pupils from our resource base in sport. To increase swimming ability to enable pupils to compete in a festival. To take part in a wide range of festivals. To take part in a wider range of level 2 competitions. To qualify for a level 3 competition. To introduce level 1 competitions within school. Participate in an SEN festival. £65 Girls took part in a girl’s football festival and a girl’s cricket club. Over the last year we have taken part in 15 festivals: mixed cricket, girl’s cricket, SEN cricket, SEN table cricket, athletics, mixed football, rugby, girl’s football, mixed netball, mixed hockey, quick sticks hockey, swimming, gymnastics and dance. Pupils have been exposed to an increase in sporting competition across a wider range of sports. The successes and achievements have been celebrated and shared with the school to increase an awareness of sport. To set up a level 1 golf competition for KS2 and KS1. Provided extra swimming coaching to pupils taking part in the swimming festival. Qualified for a level 3 gymnastics competition. Buying a mini bus to allow more flexibility to take part in competitive matches. Continue to offer sporting clubs through the year to develop skills to try and improve the success rate in competition. To try and create opportunities to take part in friendly matches prior to taking part in the festivals.